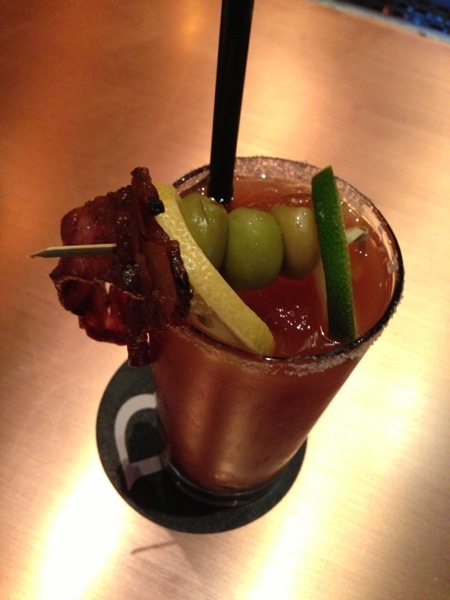 I've posted before about the bacon Bloody Mary here at the Blacksmith. They are unique and very tasty - especially so after a 12 hour photo day! The concoction seems to change slightly each time I visit and this one was really good, so I thought I'd post it again - especially now with my new found appreciation for bacon. The flavor is bold and rich, as you'd expect coupled with bacon. It had a salted rim but a smoky flavored salt and Maria Del Sol olives would have made it among the best. This cool little restaurant in the old Mill has a great atmosphere and nice happy hour goodies. They said the bloody could be made with their fiery hot habanero vodka, but I opted for something a little tamer - oh but not too tame. The flavor was very nice, sans horseradish. A flavor salted rim and a plethora of garnish rounded out this tasty blend. The cilantro was a nice touch. You know it's a good one when it's empty before you know it! Pure is a relatively new spot in our restaurant laden little town. We are fortunate to have some great choices in cuisine! Pure was started by a young couple from NYC where they came from a family owned Thai restaurant and decided to try something new in a much smaller, and quieter town. .
On the weekends, Pure has a brunch with a Bloody Mary bar, so you can build your own concoctions. We came in last night, however, and had the bartender whip up his own special. I asked for it spicy, and he delivered! It had a nice, robust flavor, with no overpowering horseradish flavor. The pickled asparagus was a nice addition. A salted rim would have enhanced it a bit as would Del Sol olives. While teaching a photo workshop in a part of the country I have not spent time in before, we stumbled on a couple of great restaurants. One of them was Otto on Main St. The food was wonderful and the BM was quite good as well! The blend was fresh and home made, flavorful with just a hint of horseradish. While it was a good drink, it did not stand out as very original. We've decided that cave men did manage to mash tomatoes to blend with their vodka, so it is indeed paleo. Wow! What a presentation! I love a BM that's a little over the top :-) She said "It's spicy tonight" so of course I had to try.it. The homemade recipe was subtle on the horseradish, which I like. It had a rich flavor and it definitely was spicy! I made the mistake of eating half the red pepper garnish. Phew. We came to The Brickhouse in Bend for my sons birthday. He wanted a good steak. 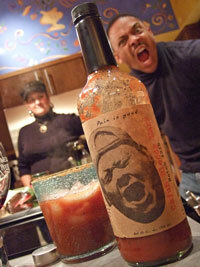 Although a bit ordinary looking, the Bloody had a nice flavor, especially when made with Mazama pepper vodka. Nice and spicy, not too horsey radishy. The olives were not great, generic and too firm. Flavored salt on the rim would have been nice. Ahh, the whirlwind three days are done! I just finished a three day workshop for CreativeLIVE and a bBloody Mary couldn't be a better topper. This was a tasty one, just the right amount of horseradish, spice, and vege stuff. The wonderful company of photog friends made the ILQ go though the roof! Crisp beans and standard olives top it off. When the Bloody Mary is a featured item on the menu, I generally assume its worth giving a try. Usually this works out for the best and I'm a happy camper. I ordered his one off the menu and was not impressed. The flavor was a bit weak and non-descript. I tasted vodka and horseradish, that's about it. Sigh. It was not terrible, so I'm drinking it. I'm thirsty. this special concoction from scratch using pickled jalapeños, horseradish, garlic, olives, lime, Tabasco and love! The company I kept was the best part of all - with an old friend and some newish ones. We munched in fried appetizers and chatted about all things...that eventually all lead back to photography. It was a great evening. The Bloody Mart was actually quite good too! While not loaded with unique garnish, it did sport a couple olives and a pepper. The rim was lightly salted and the flavor was mildly spicy without much horseradish (which I prefer). It had a nice balance to it and while it could have used a splash more vodka and personality, it was completely satisfying. Our friends invited us to this amazing breakfast spot, claiming it was the best brunch in the city. I definitely wouldn't argue that. It was DELICIOUS! 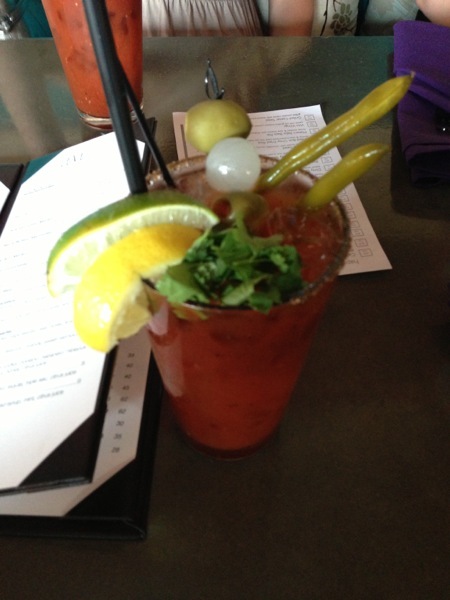 Then, they talked to another friend who also said it had one of the best Bloody Mary's in the city! This was my lucky day. The Mary was wonderfully flavorful. It was spicy - just right. There was a hint of horseradish, but not overpowering. There was a slight sweetness that balanced the kick perfectly. I would have liked to see a little more salad bar quotient, but it was thoroughly delish. Good friends, good food, and a good BM - what better way to spend a morning! I've blogged this Mary before, but now they have a new bartender and what was once a really good bloody is now even better! The recipe remains almost the same: The Cured Mary is bacon infused with crushed bits and sugar on the rim. Yum. The ILQ was definitely influenced slightly by the prescence of my lovely wife on our date night. 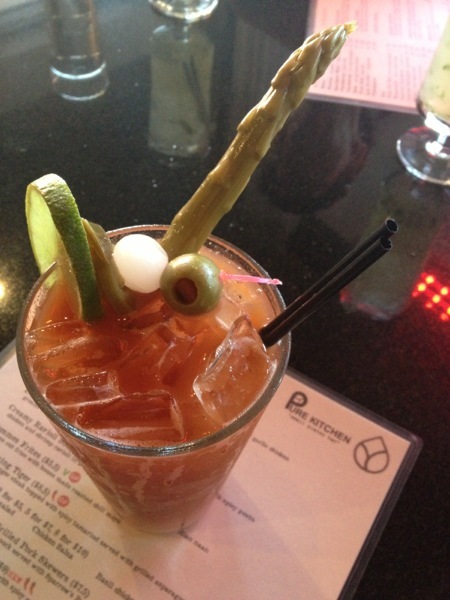 I love kim chee and when there's a kim chee bloody mary on the menu, you can bet I'll try it. This restaurant just opened and the food was marvelous. It's an eclectic mix of asian influences from Thai to Japanese. Most of the items are small plates, but the servings were generous. There was a definite spicy trend going on, which we loved. The bloody was very unique and quite tasty. it was a bit heavy on the horseradish for my taste, but the kim chee flavor and lighter consistency made it appealing. I had first heard about mixing beer and clamato when I saw the Budweiser and Clamato can at the local liquer store. I thought it sounded gross, but had to try. It was OK, but not quite right. it had potential though. Here at Diego, they have a whole selection of Michelada and I had to try again. I had one with Tecate, Clamato, Worchestershire, salt, pepper, and lime. The seasoned salt rim made it kick. I didn't really expect to find a great bloody mary in Cambodia, but we went to this great "Americanized" restaurant on the recommendation of a local friend. It was as nice as any trendy vegas dig and the food was great. I generally prefer to eat authentic when I'm traveling, but this spot sounded really good, and it was! The bloody was pretty straight. No flavors or secret recipes, just old school tomato juice, vodka, and too much Worcestershire. It was drinkable, but not finishable. Sent from my iPhone-messages may be brief. 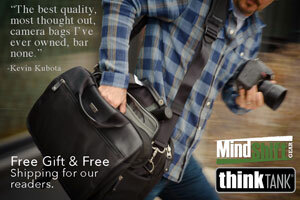 You might like that. This was my first visit to this fabulous vegan restaurant and it lived up to it's reputation as one of the best vegetarian places in town. My meat loving friends were skeptical, but soon appeased :-) Highly recommended! This rustic chic establishment has won numerous awards and write-ups and is a local favorite. They specialize in steaks, but also have a tasteful and balanced selection of seafood and other delectable dishes. The crab corn dogs were a big hit with the entire table and everything else was equally as unique and delicious. The bloody mary was definitely unique with it's bacon infused vodka and bacon bits on the rim! I'm not a big bacon eater, but this was too interesting to pass up a try. Fortunately, it was most excellent! The flavor was rich and slightly smoky, just the right spicy, a tad sweet, yet not overly bacon flavored. The pickles & olives were unique and varied in flavors. Yum. Nearly perfect.